With a commitment to unparalleled care and service delivery, Comprehensive EyeCare of Central Ohio (CECCO) provides a full spectrum of ophthalmology services to meet the needs of your family. Every patient is offered an integrated approach to eye care, incorporating the expertise of our board-certified ophthalmologists, optometrist, and licensed opticians to provide individualized treatment. Blending medical, surgical and consultative services with a spirit of compassion and service excellence, CECCO offers state of the art technology and the most innovative procedures, including Laser Vision Correction (LASIK, LASEK, and PRK). 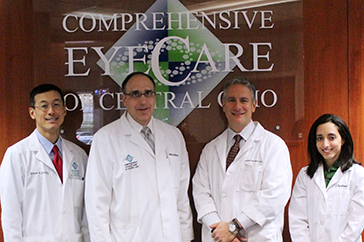 The doctors and staff at Comprehensive Eyecare of Central Ohio are dedicated to providing the highest quality care in meeting the personal needs of each patient. Want to get some exercise and help a great charitable organization?